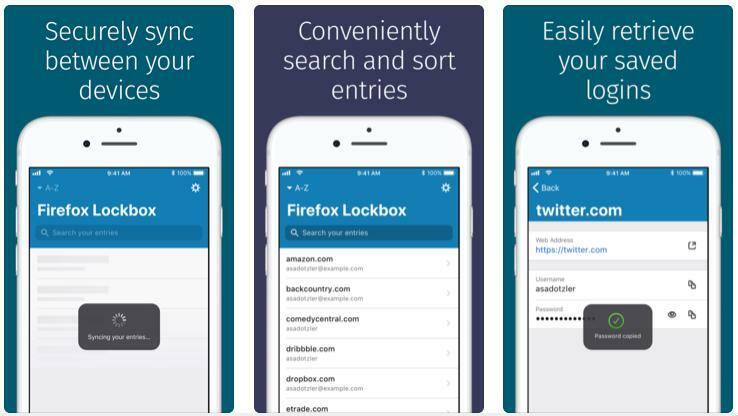 Mozilla Foundation has launched its Lockbox password manager app on the Google Play Store. The application works on Android 7, 8, 9 operating system and it is ad/in-app purchase free. Its size is 43 megabytes. Is the new password manager app worth using? What features does it provide to the users? Is it secure? Let’s find it out! LockBox requires 3 permissions to work – auto start, network access and see network connections. To use it, you must have a Firefox account. Also, you should be a user of the Firefox mobile or desktop browser. While creating a Firefox account, the app prompts users to enter their age and password. They’re also asked to verify their email address. Once the account is verified, users should tap the continue button displayed in the application to get started with Firefox Lockbox. Once you log in, you’ll see a list that contains the login credentials of various websites. LockBox enables users to sort this list alphabetically and by the usage of passwords. It also enables you to search for passwords by an account name. Users are not allowed to group passwords in Lockbox nor can they export the login credentials to a file. How the list is generated? Lockbox syncs your entries automatically every time you log in to the application. It doesn’t have the option to disable automatic syncing of passwords. LB doesn’t let users sync their login data manually. To sync passwords from desktop to the app, you must log in to your Firefox account on Firefox Android/IOS or desktop browser. Firefox can autofill the text fields displayed on websites. To enable this feature, you must provide Lockbox the permission to auto-fill forms. Users can configure Firefox to auto lock the application after N minutes with the settings interface. They can also disable the auto lock or auto-refill feature. Lockbox sends usage reports to the Mozilla servers by default. You can disable this feature from this interface. When it comes to security, LockBox is a sophisticated product. According to Mozilla, the app employs AES 256 bit block cipher algorithm, Onepw protocol, and PBKDF2/HKDF key derivation functions to save/retrieve passwords. Firefox lets users unlock the app with their finger or face. You can enable this feature during the setup process. In case you want to use a passcode, tap the “Skip For Now” option. The app also prevents users from taking its screenshot. UI: The app’s user interface is beautiful. No advertisements: Mozilla LB doesn’t have in-app purchases or ads. Wastes time: Users must enable the syncing feature on Firefox desktop. They are also asked to create a Firefox account. Another downside of Lockbox is that the app doesn’t allow you to save the password manually. Also, users cannot edit, generate or delete the password with this application. The app only allows you to see and use the passwords you have saved with the Firefox browser. Internet connectivity issues: At times, FF Lockbox fails to connect to the internet even when mobile data/WiFi connection is active on the phone. Should you switch from KeePass, Dashlane or LastPass to Firefox Lockbox? I am a Keepass user. I tried Mozilla LB for a few hours. I didn’t find any good reason to use it. Conclusion: Firefox Lockbox is a tool that lets users manage the passwords they’ve saved with Firefox desktop or mobile app. Lockbox is a great app for the users who use products launched by the Mozilla foundation. If you’re not a big fan of the Firefox browser, you should stay away from Lockbox and use one of these Android password manager apps. Although FF encrypts the password saved on the PC, the current logic of using the Firefox browser as a password manager is bad. Mozilla should launch a dedicated application for managing the website login data on mobile devices as well as desktops. Firefox Lockbox might become a good alternative to LastPass, KeePass, etc in the future. Right now, it's a basic application that can only auto-fill forms on websites.